My two kids are going through a tornado phase right now and I’m still getting used to it. So when I asked Mr. Pikko to watch them so I could take a nap Saturday morning, I was a bit… unnerved to wake up and find that the big Costco pack of Kirkland toilet paper we had bought was busted open and used in a toilet paper fight. Also, the books on the shelf were thrown out, the mail on the table tossed about like confetti, there were tiny little papers all over the floor because Baby Girl was “playing with scissors”, and lego blocks were all mixed in between for color. All this mess was of course enough to make my brain explode, but I think there is a good side to me having to clean the house on a daily basis. For some reason this weekend I lost a lot of weight. I was 125.7 this morning! Or maybe it’s more sleep? Well, whatever it is, I’m happy. Carry on kids! 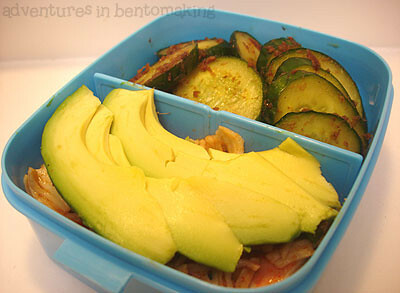 I’m really unhappy with my bento today as it was done in a rush and simply don’t like the way it’s put together. Mr. Pikko was all cranky with me this morning for taking a long time so I’ll definitely have to do this at night all the time now. I’m sick of rushing in the morning anyway. On the left I have a dog shaped onigiri with a dog shaped slice of turkey with a nori face on top. I have the onigiri mold and cutter to make both these shapes along with the bunny and bear shape available in the store right now. Under the doggie I have two slices of fish cake made by my MIL and given to us before she left. Next to that I have two Aidel’s teriyaki pineapple chicken meatballs cooked in Mr. Yoshida’s sauce. Then I have corn in a Miffy cup and an orange bell pepper stuffed with Laughing Cow Light Swiss cheese, something I’ve seen others do that I’ve wanted to do for a while. I’m not sure why this pic came out so blurry but this is my fruit layer, which has slices of white peach, grapes, and some blueberries. It’s a funny thing about these blueberries. I am not a blueberry fan. I love all berries but have never really taken to these much. So when I took the kids to Costco on Friday, for some reason Baby Girl wanted them in the worst way. She asked me I swear, at least 50 times to buy her a pack of blueberries, insisting she loved them and that she promised to eat them. Since her word as a toddler is about as good as a year-old-expired coupon, I said no at least 50 times. Finally though, she cracked me and I bought one. I figured I could give them a try again and lo and behold, I did like them. And I would eat them in a box. And I would eat them with a fox. Yeah, it’s like Green Eggs and Ham in real life. Scary stuff. I’m eating them in a box but thank goodness I don’t really have a fox to eat them with. Or I do, but he always eats at work. Anyway, that’s why they’re in my bento today. I haven’t been able to stop eating them all weekend. 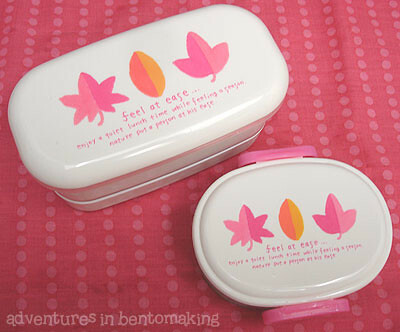 I used my pink Feel at Ease box today with the matching side container that I found in Little Tokyo in July. I have edamame in that container. The fruits were bulging out so I had to use the furoshiki in the background to tie it up tight. I am happy to report that Hawaii won against Louisiana Tech last Saturday. It was a nervewracking game that I had such a hard time watching because I was sooooooo nervous. So much hangs on every game and to have it be that close and have so many mess-ups was very hard for a fan to watch. UNLV this weekend will probably be even harder to watch. 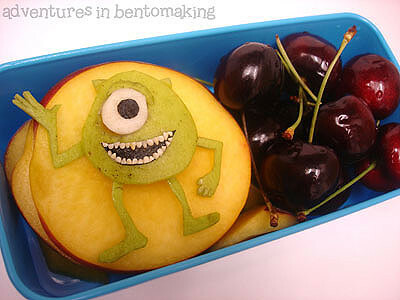 I have a great idea for our next football bento, so stay tuned next home game for that. As I mentioned last week, I started my Live Journal documenting my costume making effort for the Final Fantasy XI Festival coming up in November. Doing this has really got me interested in sewing again and this weekend I bought a pattern for a blouse and some materials to make my own shirts. If anyone else out there likes sewing or scrapping, I found some good coupons for shipping at Joann.com from CouponChief. They also have a good one for free shipping on baby and maternity clothes from Old Navy. I always forget to check coupon sites before I go shopping so I definitely need to make a better effort in that area. “Free shipping” are magical words to a cheapass like me. I really wish I could stop the outlines from appearing around every single image but bleh, if that’s the price I have to pay for the nice green border, so be it. Nothing much to offer today because we’re having a luncheon at work. 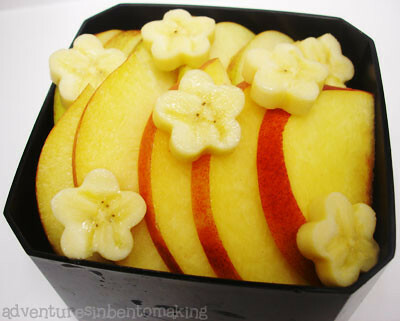 I still had to pack snacks though, so I’ve taken a picture of my fruit bento. In it there are slices of some Jonagold apples, which I bought at Costco because they were the cheapest ones. They’re pretty good, interesting taste and a little tart. There are also peaches and banana flowers. I put the rest of the banana slices and flowers on the mini Eggo waffles for the kids this morning and they went bananas over it, haha! I got on the scale this morning and I’d gained a pound and a half, so apparently my 3 day dessert binge this past weekend has finally caught up with me. Plus we ate sushi last night and though I didn’t eat much, I ate past being satisfied then had Jamba Juice afterwards. *sheepish face* So today, I have an all Core bento, which I decided needed a nice joke to spruce it up. It’s point-less. GET IT? Ahahaha! No? Well, fine then. I thought it was punny. One side has my kim chee crab and the avocado on top. The other side has some cucumber pickles that I made this morning. I finally bought this book I’d been wanting on Amazon called Easy Japanese Pickling in 5 Minutes to One Day and though this is only the first recipe I’ve tried and I haven’t yet eaten the pickles, the book itself looks pretty awesome. It’s got lots of nifty pictures and easy instructions. The recipes themselves have very few ingredients. The one I chose today is called “Tosa Style Cucumber Pickles” and it took me less than five minutes to prepare. They’re to soak for 20 minutes but I only had enough time to let them soak for 15. I figured they’d be sitting in my bento for a bit anyway so it didn’t matter. It’s basically a sliced cucumber with shaved bonito and soy sauce. We’ll see how it tastes. 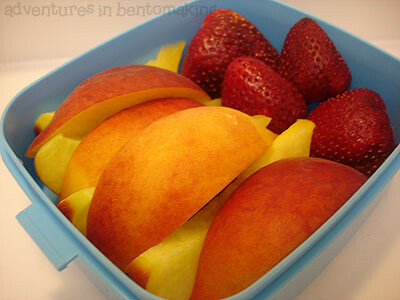 My fruit layer consists of yellow peach and a few strawberries. These are the good strawberries I have. To me there are two different varieties of strawberries and I can always tell which ones are the ones I like. At Costco I bought a big box of the yuckier ones (they look fat and the seeds stick out) to make fruit leather cause I bought a food dehydrator to preserve the Costco fruits we can’t manage to eat in time. It’s pretty awesome and the kids love it even though there’s no sugar added. Instead of showing a boring picture of what is just lettuce in my top layer, here is a picture of my bento all packed up in my Doggie Woogie container. 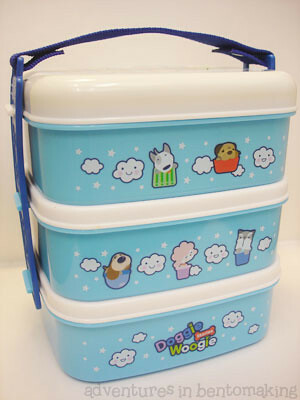 Though this is one of my most costly bento boxes, I’ve found that it was well worth it. I’ve used it on many occasions and it’s the perfect size for taking a day’s worth of food to work instead of packing 3 different bento boxes.